It was a joint effort of Radio Amateurs, PolySat and the CubeBUG team that finally resulted in the decoding of the faint AX25 signals that are transmitted by CubeBUG-1. 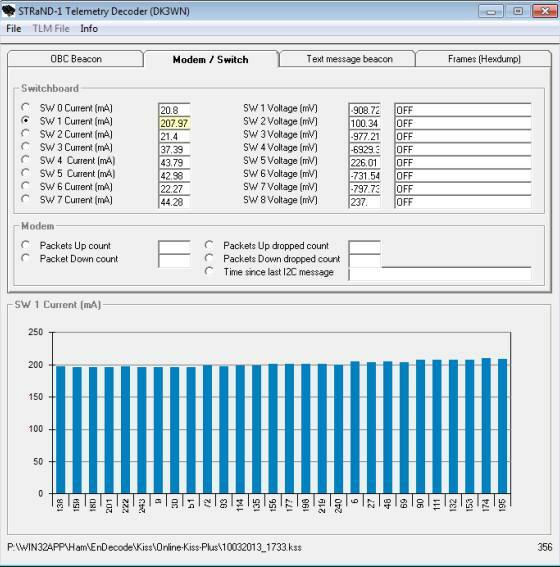 PolySat had recorded a audio file that could be decoded by DK3WN with the use of MixW. The settings used with MixW where standard VHF 1200 baud modem. Finally successful in decoding STRaND-1 telemetry. After experimenting with different 9600 baud packet decoders I am finally able to the decode the satellites telemetry. The combination of FCD Pro+ -> Audio mixer -> MiXW -> VSP Manager -> Online Kiss made it possible to produce the following image.